The global automated guided vehicle market is expected to reach revenues of approximately $5 billion by 2023, growing at a CAGR of around 18% during 2017-2023. CHICAGO, IL, UNITED STATES, October 3, 2018 /EINPresswire.com/ — Arizton’s recent market research report on the global AGV market provides comprehensive industry analysis, trend forecasts, and competitive analysis. The research study segments the market by navigation (laser guidance, magnetic guidance, vision guidance, inductive guidance, natural guidance, and others), by vehicle (tow vehicles, unit load vehicles, pallet trucks, forklift trucks, and others), by end-users (automotive, retail, food & beverage, healthcare, and aerospace), by geography (APAC, Europe, North America, Latin America, and MEA), and offers detailed competitive analysis. The global AGV market is anticipated to generate revenues of approximately $5 billion by 2023, growing at a CAGR of around 18% during 2017-2023. 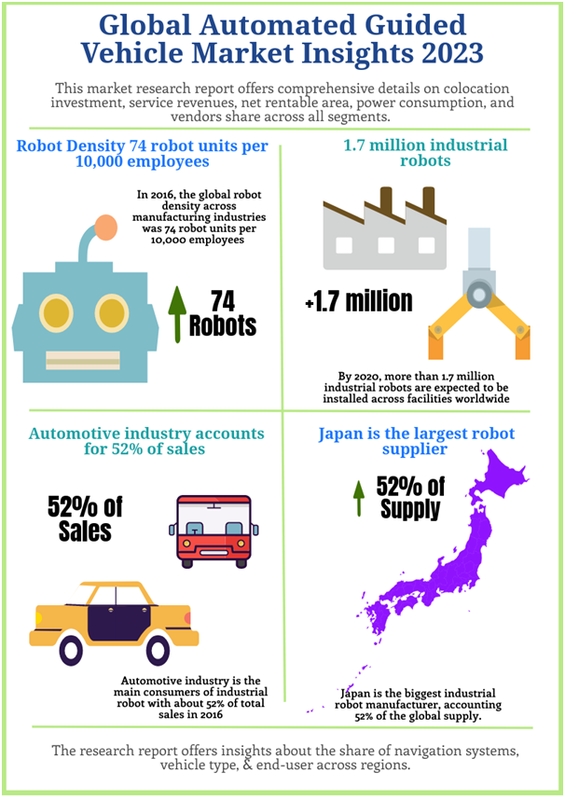 The increasing adoption of industrial robots and the growing need to reduce wastage due to human error is propelling the growth of the global market. Request for a free sample here! The rising demand and need for automation in material handling is one of the primary factors attributing to the growth of the global AGV market. The implementation of the material handling process helps eliminate accidents, reduce stress and effort on the daily operations, minimize time spent on distribution and storage, and eliminate redundancies thereby reducing operational costs in the global market. The increasing focus on safety specifically for industries dealing with heavy machinery and harmful materials such as chemicals, metals, and radioactive substances is encouraging the adoption of automated machinery in the global AGV market. According to the International Labour Organization (ILO), occupational accidents or work-related diseases are the major cause for the death of more than 2.3 million people globally. The rising demand for high-quality products at competitive prices is driving the need for industrial automation in the global market. The automation in the material handling process helps increase the productivity and improve safety across industries in the world market. The implementation of equipment such as extensive conveyors, sortation machines, automated storage and retrieval systems (AS/RS), and SDVs (self-driving vehicles) will help reduce turnaround time and maintenance costs in the global AGV market. The increasing focus on worker or employee safety is leading to the implementation of high safety standards at workplaces in the global AGV market. Forklifts are an essential part of the warehouses and production centers and are also the cause of fatal accidents across industries in the global market. According to the Occupational Safety and Health Administration (OSHA), in the US there are more than 100 fatalities and 20,000 serious injuries in forklift-related incidents annually. The implementation of various safety protocols in production units and warehouses such as radiation safety, chemical safety, explosive safety, machine safety, safety in transportation, and checklist for training aids and inspections is driving the growth of the global AGV market. The manufacturers are using automated guided vehicles to create a safe working environment as the sensors in this vehicle helps in detecting humans in blind spot regions in a production unit. The increasing use of these AGVs will improve material handling efficiency, productivity,and consistency in the market. These vehicles are designed to travel in a predetermined pathway with consistent and precise movement, resulting in fewer accidents, less product damage, and greater routing flexibility across factories in the global AGV market. The introduction of natural and laser-guided vehicles will help increase the safety standards across industries in the market during the forecast period. Looking for more information? Download a report now. The advent of artificial intelligence (AI) and use of this technology in everyday life starting from smartphones to automotive will encourage the adoption of this smart tech in the global AGV market. The increasing use of industrial robots that are capable of performing complex operations such as microscopically precise assembly will transform the global market over the next few years. The industries are leveraging AI to enhance the productivity of their industrial operations in the market. The development of machine vision that enables robots to see objects, analyze it, and take required decisions or actions will boost demand in the global AGV market. The use of AI in manufacturing and supply chain management will improve the performance and operations in the global market. AI can now detect patterns for the demand of products across time, geographic markets, and socioeconomic segments while taking into account macroeconomic cycles, political developments, and even weather patterns. Such abilities will help improve the decision-making process for inventory management, maintenance of equipment, raw material sourcing, finance, staffing, and energy consumption in the global AGV market. global automated guided vehicle market is witnessing a diverse structure in competitive dynamics and intensity of competition across geographies. The players are offering competitive prices to sustain the intense competition in the global AGV market. The exponential growth of the automotive and e-commerce sectors is creating lucrative opportunities for leading vendors in the market. The leading manufacturers are focusing on expanding their businesses in the APAC, Latin American, and MEA region to gain a larger global automated guided vehicle market share during the forecast period. The increasing investments in R&D activities will help players gain a competitive advantage over other vendors in the global AGV market. Other prominent vendors in the global automated guided vehicle market include KUKA, Hyster-Yale Group, EK AUTOMATION, Seegrid Corporation, Kollmorgen, Quirepace, Fori Automation, AGVE, SSI SCHAEFER, Transbotics, Savant Systems, Jungheinrich, and Fetch Robotics. The complete overview of the latest market research report on global AGV market by Arizton is now available.